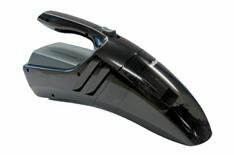 Halfords Cordless Re-chargeable Vacuum | What Car? For an innocuous-looking cleaner, it provides surprising results. Used in conjunction with the brushing tools, it extracted ingrained dirt from carpets as well as sucking up small stones and leaves without any problems. It provided effective suction for a reasonable 14 minutes, too. Its layout is simple and intuitive. Access to the filters and dust compartment is easy, and they slot back together with a reassuring click. It strikes a nice balance between weight and ease of handling, too. This cleaner is reasonable value, offering more performance than you would expect for the money. Discounts are impossible to find, as the cleaner is only available through Halfords stores. It's solid enough for the job, and should survive the rough and tumble of being pushed into tight corners without the need to be too careful. It's a fairly standard-looking cleaner with one nice touch the attachments fit into a cubby hole in the rear, ensuring they won't get lost in between use or rattle around in the boot of your car.